A rocky, tussock swept land, Central Otago's Poolburn evokes the imagination and lays claim to impressive engineering feats of the former railway line. Poolburn is situated just 7km inland from Omakau and Ophir, approximately 30 minutes from Alexandra. The drive via Poolburn in the Ida Valley takes you to the historic town of Oturehua. It is an optional route to rejoining SH85 heading towards Wedderburn. Poolburn of today is very different to the township it once was. Gone are the shops and other businesses, however, the primary school and hall continue to serve farming families throughout the Ida Valley. As with many rural schools, it is very much a centre for community activities. Over the years it has been used as a polling booth, and for wedding receptions and political meetings. In days of old, Central Otago gold miners would take their fortunes or hard luck stories back to Dunedin, winding their way up South Rough Ridge and staying at one of five hotels now under water at the Poolburn Dam, before descending into the Maniototo Plains at Pareau (Styx). 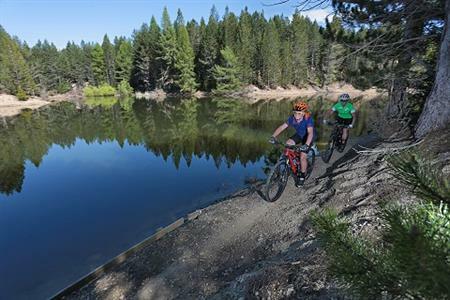 An excursion off the Otago Central Rail Trail via Moa Creek to visit Poolburn Dam is more comfortable by four-wheel drive than bike. Access the Dunstan Trail at the Poolburn Dam via the left track, crossing below the dam. Continue left onto the trail and over South Rough Ridge, down to the Upper Taieri Plain and up over the Rock and Pillars. The nearby section of the Otago Central Rail Trail into the Poolburn Gorge towards Oturehua will go past stunning scenery, tunnels blasted through schist rock, and across the awesome Poolburn Viaduct with schist rock piers and abutments. Access to the trail and these sites is also available off Thurlow and Auripo Roads. Experience the sense of peace evoked by the expansive Poolburn landscape as you venture to its stunning sites.